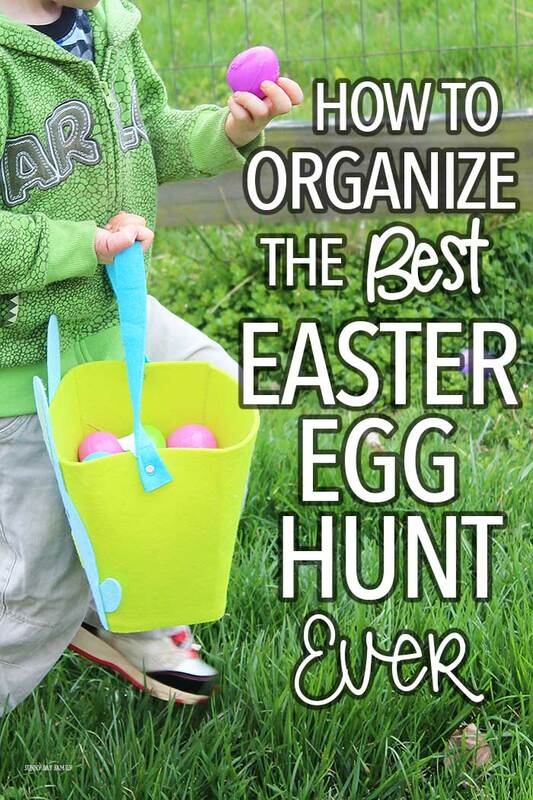 Organize the best easter egg hunt in town with these easy tips! Let me tell you about the worst Easter egg hunt ever. When I was a kid, my parents rotated holidays with my aunts and uncles so that we could have big family celebrations with all our cousins. The first year that one of my aunts hosted was a disaster. She didn't realize that she needed to boil the eggs before coloring and hiding them, and the result was a complete mess. Broken eggs everywhere. And did I mention it was an indoor egg hunt? Hopefully it goes without saying that if you're reading this and preparing to plan an Easter egg hunt, you know to either hard boil your eggs or use plastic eggs. 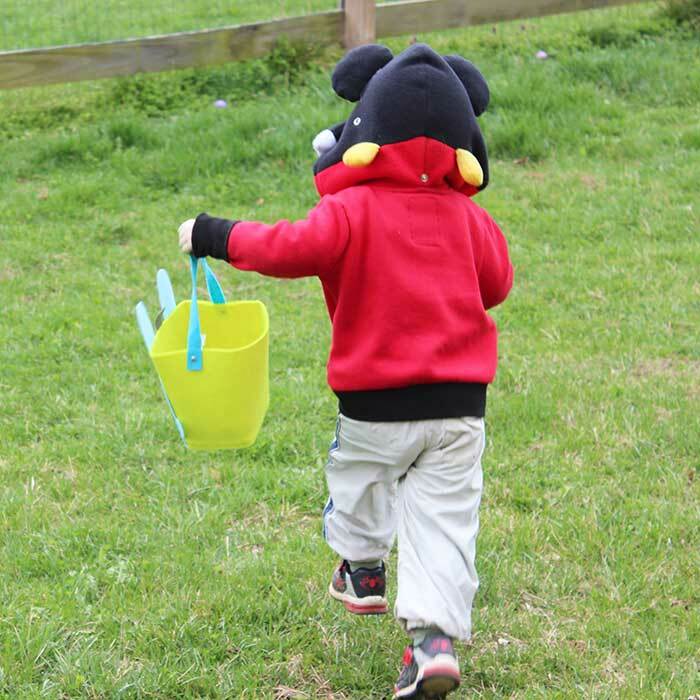 But there are a few more things you can do to make yours the best Easter egg hunt ever - and I have a few tips to help you along. Start by sending out invitations and keeping a list of how many people will be attending, so that you'll know how many eggs you will need. Depending on ages and your budget, you can plan for 10-12 eggs per child. If you're hosting a large range of ages, you may want to separate your egg hunt area into sections - one with easy eggs for the little kids and one that is a bit more challenging for older kids. The last thing you want is for bigger kids to take all the fun before the toddlers can even start. If you'll be using plastic eggs, you'll need to decide what you'll use to fill them. Candy is great, but you don't want to create a total sugar rush on a day when the kids may have already gotten treats from the Easter Bunny. There are tons of choices out there for non candy options. You can find eggs already filled with everything from Play Doh to dinosaurs. Or be the coolest hunt on the block with this LEGO Easter egg hunt idea. 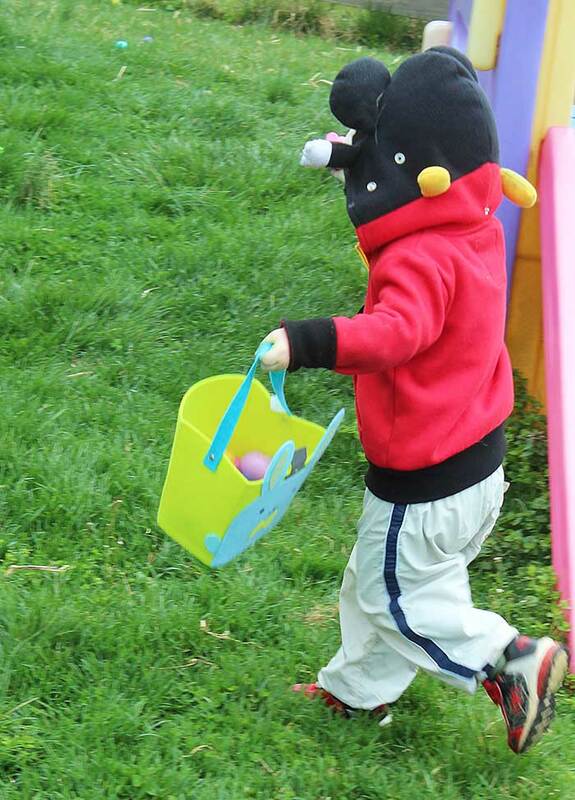 Most Easter egg hunts take place outdoors, and you should do a quick check of your area before setting up. Clear away any broken sticks lying around so no little ones trip and fall, and clean up any pet waste. If you are hosting your hunt at a park or public space, you may want to mark the boundaries of your hunt area for safety. Wherever you are, make sure there are plenty of hiding places in reachable areas according to the age of the children who are hunting. For older kids, stick some eggs on a lower tree branch. Bushes, flower pots, or flower beds make excellent secret spaces to stash an egg. If the hunt is indoors, plan ahead to move furniture to allow space for running around finding eggs, and put away any breakables. You can also use the furniture as hiding spots; place an egg close to the front but under a chair or couch. If you have any tables with drawers pop an egg or two in different ones. Having additional Easter baskets on hand is always a great idea. Make it into a craft for the kids with these fun Easter baskets to decorate or grab plain baskets from the craft store and invite kids to paint them! See our painted baskets here. Take your egg hunt to the next level with our Easter Egg Bingo - it's a super fun twist that will make the hunt more fun and challenging for everyone! Or try an Easter Scavenger Hunt. I also love the idea of a Glow in the Dark Easter egg hunt - see how to do it here. These Minute to Win It Easter Games and this Printable Easter Movement Game are sure to be big hits with the whole family. And be sure to plan to play a couple of these fun Easter party games to keep the fun going long after the last egg has been found. The key to having the best Easter egg hunt ever is to stay organized and keep all of your little details straight. 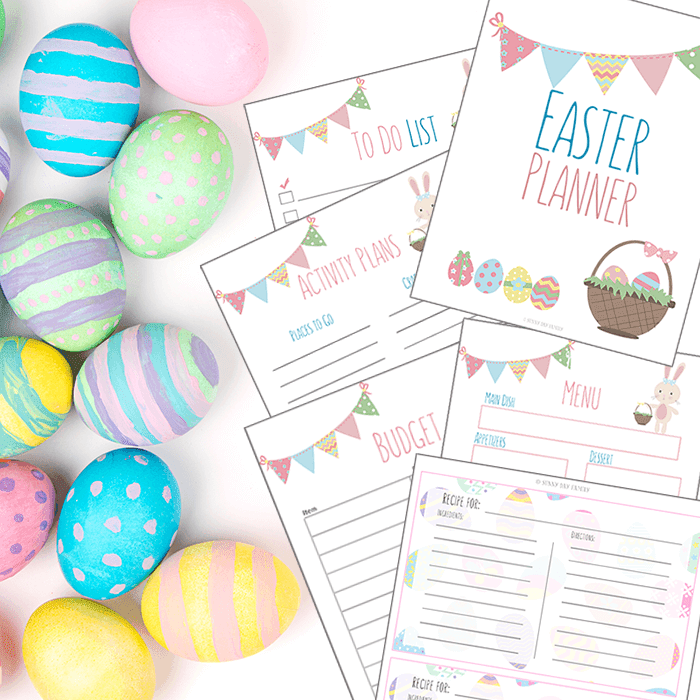 Do it with my printable Easter Planner and you can plan everything without stress! This planner will help you organize your egg hunt, crafts, activities, and even your Easter meals. It includes activity & project planning pages, a budget, meal planner, recipe cards and more. It also includes printable invitations and thank you notes - perfect for your egg hunt! Find even more Easter activities, crafts, and printables here!